Adam (bass, vocals), Jack (vocals, guitar), and Ryan (guitar, piano, vocals) Mets are three brothers hailing from my hometown, good ol’ NYC. Adam is a Columbia graduate and Ryan is currently a student there. Will Jack, the youngest at 17, follow in their footsteps? Jack was quoted in another interview as feeling a bit like “Hannah Montana” since he is still in high school and is experiencing fame now. These brothers promoted their music busking in Central Park and Washington Square Park and most recently via internet and social media. Their first electro-pop single, “I’m Ready” was tweeted out to celebs by the Mets boys and got notice from Sia Furler (one of my personal favorites originating from Zero 7 notoriety) who helped to promote the trio. These guys are talented and smart also, taking advantage of the social media craze to self-promote. I first heard the single on Sirius XM “Hits 1” station. The song has pop hit written all over it. They have since toured with The Wanted, Demi Lovato, Lindsey Stirling and Hoodie Allen. AJR’s new album is slated for release on March 3 and is named “Living Room” likely due to the fact that they have written, produced and mixed their songs in their home living room. How cute is that? Sometimes the best names are in the obvious: AJR and Living Room. An acronym and a noun I can remember. AJR opened for Melanie Martinez (famous from season 3 of The Voice) promptly at 7pm. This was an all-ages show and all ages were there! 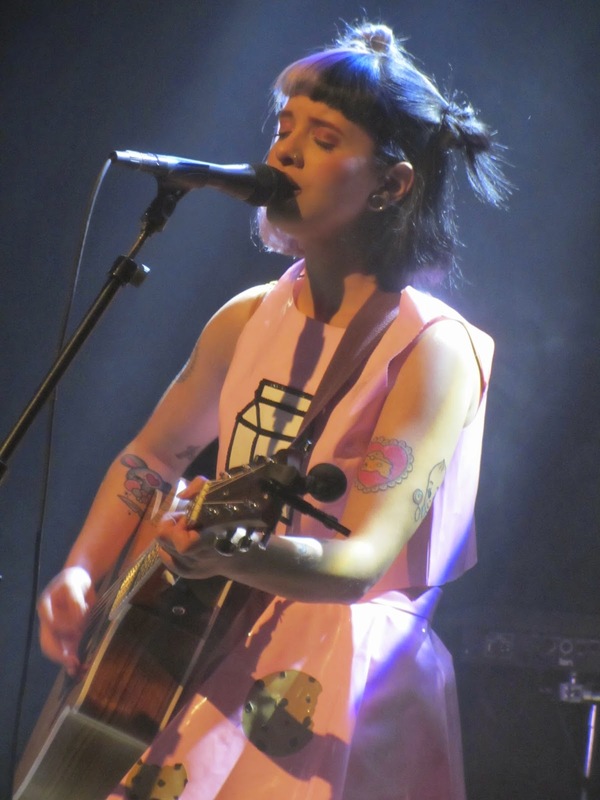 Melanie does drop a few F bombs in her lyrics and is not shy about it so mom's, if you have a problem with that, I suggest that you drop your daughter's off and pick them up later (ha ha). I ran into a couple of teenage (or tween) girls in the bathroom who informed me that they were there to see Martinez. When I heard about the show I had assumed that AJR were headlining since I had heard their music on the radio many times but had not heard Martinez on the radio. Then again, I mostly listen to satellite and she may be heard on FM radio. 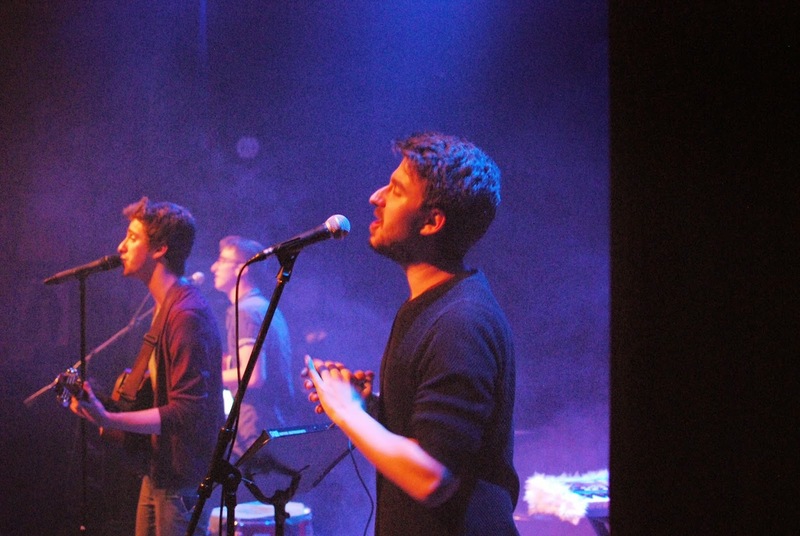 AJR was energetic and clearly had a great time entertaining the group of young and older fans. They told the story of their new found insta-fame and their origins in Washington Square, busking for recognition and coin. I think they are still humble about their unpretentious beginnings. It is great to see a bit of wholesome fun and brothers who can play nice together. Good job boys! The Jonas Brothers went their separate ways but maybe these three can last longer. It will be fun to watch them rise having seen them perform at one of my favorite small venues, Lincoln Hall, when they were just “starting out”. See video below from Lincoln Hall and the official video for the next hit "Infinity". As for the headliner, I am now an official Melanie Martinez fan. She has an amazing voice with a lot of emotion and soul. 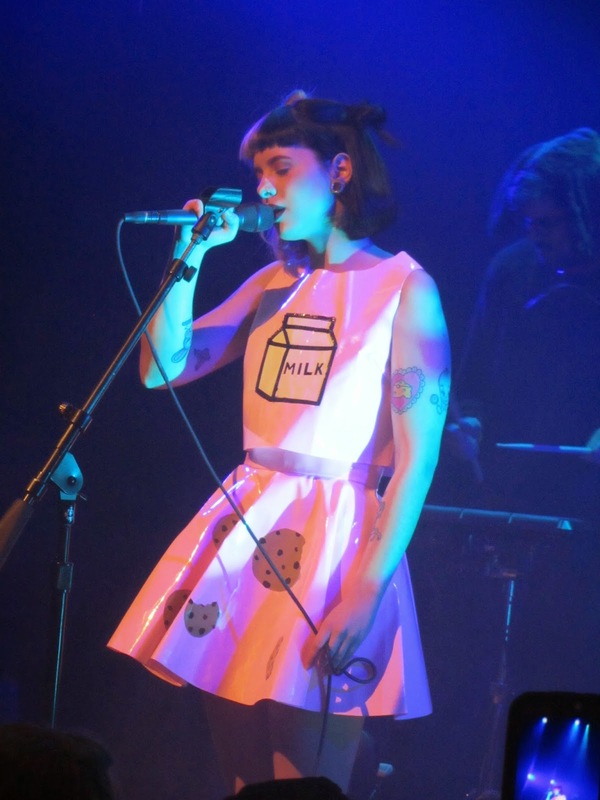 Her outfit was so adorbs - milk and cookies! How appealing to a young audience! She still has her black and white cookie hair going too (half blonde, half dark). She had great rapport with the audience. One particular fan asked if "she would adopt her". Martinez responded with "I can barely take care of myself, why would you want me to be your mother?". She is after all only a late-teenager herself. Her alt rock pop style is really top notch. You can dance to her music one minute and then listen intently when she takes it down to just her and a guitar. Her hot multi-instrumentalist back-up keyboardist and guitarist rocked bunny ears too. The girls got schtick. Looking forward to seeing her next time she is in town. See the video of "Bittersweet Tragedy" from Lincoln Hall, you'll fall in love too. If you're looking for a venue for a small event in this area, you may want to stop by and check it out. Their staff is very friendly and the food is great. We preferred this convention center because they are all-inclusive, so you don't have to worry about chairs and catering because it's all part of the package.